Johanne Jazmin Tan Jabines opened a window on the travails, experiences, and yearnings of Filipinos who are experiencing the Filipino Diaspora. This enabled her to win the plum in the recently held English Speaking Union’s Public Speaking Competition held in London. “One Hour at A Time” was Jabines’ winning piece which told of how Filipinos were dealing with the sociological impact of the Overseas Filipino Worker (OFW) phenomenon. How the realities of separation caused by economic circumstances impact the Filipino society and its nucleus, the family and the responses in dealing with such realities. It was her condensing all the emotions of millions of families separated and dovetailing it with this year’s theme of “The Best Way to Predict the Future is Invent It” which was done in all five minutes. It was not only a plaint for the loneliness of those who leave the country but also those who are left behind. Creating new forms of familial interactions and coping mechanisms is how the future is invented by Filipinos. 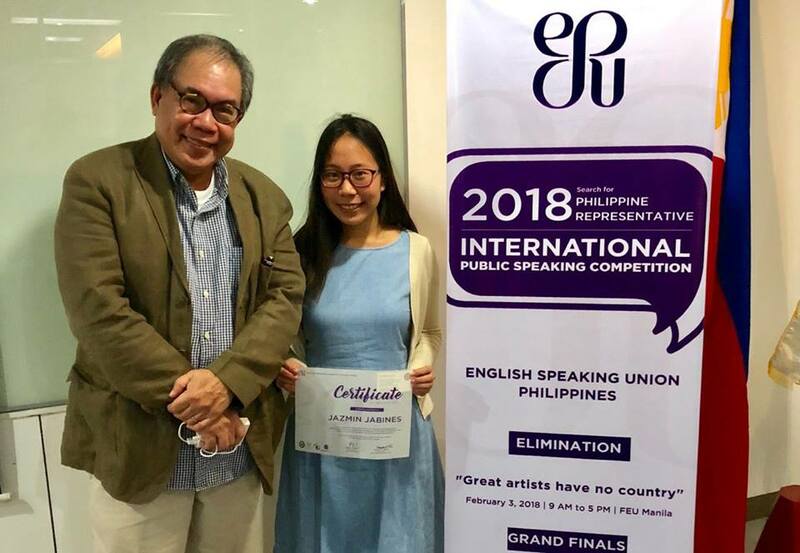 “I have received a lot of positive reactions and heartfelt comments even from strangers, thanking me for talking about our OFWs,” Jabines said. Jabines is in her 3rd year at the University of the Philippines taking up Business Administration and Accountancy. She topped the competition composed of a field of 51 participants from various countries.